Death is most frightening, since it is a boundary. 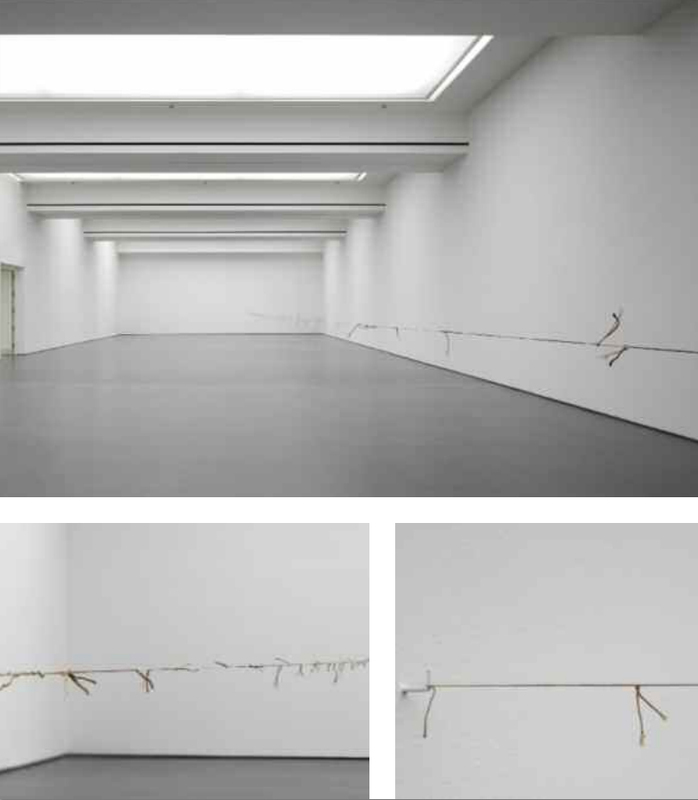 A length of thread, stretched tight from one wall to another, spans the wide, corridor-like gallery space of the Düsseldorf Kunstverein (fig.46). At more or less waist height, it cuts off one third of the gallery along its longitudinal axis, leaving the viewer with the majority of the space in which to walk and examine the thread. On closer inspection, this turns out to be 127 separate pieces of cotton thread that have been tied together using a basic knot. On each of these threads there are uneven stains; mottled, reddish-brown traces that call to mind the colour of red wine dried on a white tablecloth. And that is it. Apart from this enigmatic installation by the Mexican-born artist Teresa Margolles (b.1963), there is nothing else to look at in the Kunstverein on this day in 2006. Whilst this may appear ‘minimalist’ in the extreme, and Margolles’ work does draw upon a minimalist aesthetic in its display, the sheer, if not vertiginous, ‘emptiness’ of the room encourages us to look more closely at this length of thread. There is, after all, nothing else to look at – nothing else in which to take visual refuge. Downey, Anthony. “127 Cuerpos: Teresa Margolles and the Aesthetics of Commemoration.” Understanding Art Objects: Thinking through the Eye. Ed. Tony Godfrey. Farnham: Lund Humphries, 2009. 104-13.